If you are new to CAN, the CAN/I2C Activity Board Pro is an affordable tool to help get you started. Purchase this board together with the Komodo CAN Duo Interface and you'll receive a 20% discount off the price of the CAN/I2C Activity Board Pro. Detailed technical information about the Komodo CAN Duo Interface can be found in the User Manual. 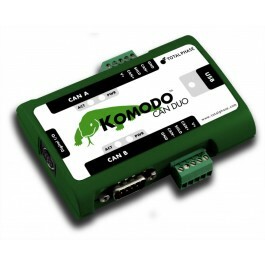 The Komodo CAN Duo Interface comes complete with a royalty-free API. By saving just a few hours of engineering time, the Komodo CAN Duo Interface will have paid for itself.